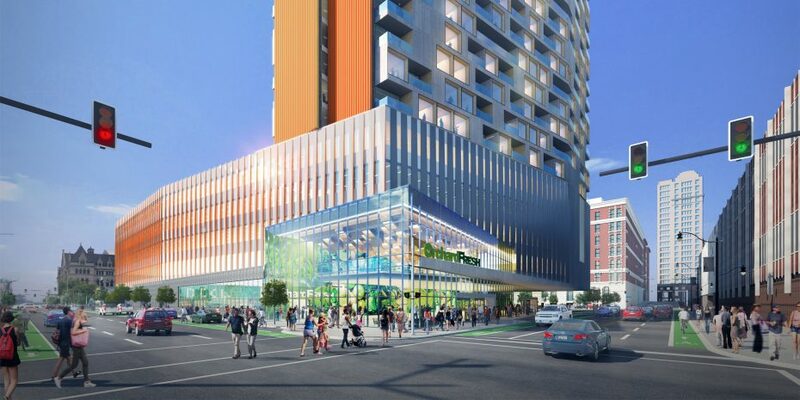 Downtown was supposed to get a grocery store with twice the floor space. The 800 parking spaces first proposed for the accompanying apartment complex are now down to 29. And that 12-story tower, which included public space with a cinema screen? It's now seven stories with a lone storefront housed in a two-story steel structure. "This is a typical bait-and-switch," said Rocco Termini, a downtown developer and part-owner of Hotel @ the Lafayette, which sits across the street from the site of the proposed 201 Ellicott project. Termini is threatening a lawsuit against the developer, Ciminelli Real Estate Corp., unless more parking spaces are added. "We are so desperate for development, and it's a travesty that we settle for such mediocrity," Termini said. "Buffalo can do a lot better than this." But Ciminelli and the City of Buffalo call the revised project more sustainable. It'll bring 201 affordable apartments and a market with fresh food to what is now a parking lot. "This project has definitely evolved over time because of the economic realities of Western New York and through a lot of community feedback," said Matt Davison, a project spokesman for Ciminelli. "Overall, the notion of attractive and affordable housing is something the market is ready for." The development company originally pitched 200 condominiums and market-rate apartments in two buildings, one with four stories and the other 12 stories. Also part of the plan were parking for 800 cars; 110,000 square feet of office space; the public plaza; and 40,000 square feet of retail space. The plan now calls for affordable apartments that are in short supply downtown, meeting a long-held goal of the mayor's. But the scant parking and down-scaled food market have irked others. The near-disappearance of parking for such a big project may be the biggest change of all. The Green Code, which took effect in 2017, eliminated mandatory parking minimums as a way to promote walkability, mixed-use development and density. The project includes easy access to car-, ride- and bike-sharing. The site is also a short walk from two Metro Rail stops and the downtown bus station. But car owners are concerned. Downtown resident Susan Wald wants to be able to drive when she shops. "I'm a little nervous about the parking situation," Wald said. "I want good parking, and a good flow in and out [of the market]," added Emily Snyder, who also lives downtown. When first announced in August 2017, the plan included a parking ramp. Termini's hotel guests use the 380-space parking lot where the project would be built. He questions how an identified need for 800 cars two years ago suddenly vanished. "They say they want to create a walkable community," Termini said. "OK, the best ones are Elmwood and Hertel, and they have two food stores that both have parking." Termini, also treasurer of Buffalo Civic Auto Ramps, said all of the parking ramps in the vicinity have waiting lists for monthly passes. "Where will all the people who live there and work there park?" Termini asked. The project's backers expect a fair number of tenants won't own a car and will take advantage of public transportation. Car owners can use the 2,500 parking spaces within a two-block radius, including the Adam Ramp, said Brendan Mehaffy, who heads the city's Office of Strategic Planning. Local studies and national trends show a segment of the population wants to walk to get to work, stores and entertainment venues. "In terms of mass transit in Western New York, there is no site that has as much access as 201 Ellicott," Mehaffy said. So, the developer and the city saw no reason to invest $10 million or more on a parking ramp, he said. The project originally anticipated a 12,000- to 15,000-square-foot Orchard Fresh market. The attractively laid-out gourmet market in Orchard Park includes a wide selection of organic produce, fresh bread, seafood, pastries, artisan pizzas, craft beer and ready-to-eat meals. It's the kind of market where Johnnie Ryan and Dr. Brown sodas are on the shelf instead of Coke and Pepsi, and protein bars but not candy bars are sold. A rendering of Ciminelli Real Estate Corp.'s original proposal for 201 Ellicott St. But Orchard Fresh dropped out of the project. That's when Stuart Green, who has owned Braymiller Market for three years, stepped in, although he was apprehensive at first. Green's business revolves around selling fresh fruits and vegetables at affordable prices. The amount of groceries available at his Hamburg store takes up about as much shelf space as found in a convenience store. A recent visit found little organic produce, a small number of frozen items, a plentiful cheese and meat case and another stocked with prepared foods. Green said he was approached about a year ago and began researching the site. He concluded a grocery store could only be sustainable if it was combined with his wholesale operation, which delivers produce to restaurants and to special events such as festivals and carnivals. His plan calls for four loading docks in back of the building. "Our real claim to fame is during growing season," he said, when his company brings in produce from across the region. He said he would keep an open mind to what Buffalo shoppers want. "The urban shopper is significantly different than a suburban shopper," he said. "If you're out in the suburbs, you expect to park in a parking lot that's the size of Rich Stadium." Green said his Hamburg store doesn't sell items such as cat litter and laundry detergent, but he was open to adding them if there is a demand. His standalone store at the corner of Ellicott and Clinton streets would be 20,000 square feet, but only 6,000 of it for the grocery store. "I was hoping for an actual supermarket," said Mike Pacificom, who works downtown. "I grew up in Hamburg so I am familiar with Braymiller's, and it's really just a glorified farm stand." At the same time, the opportunity to buy fresh produce – Braymiller's stock-in-trade – and to pick up prepared foods and some groceries would be welcomed by others. "We don't have anything downtown close by," said Wald, who lives downtown. "If I run out of milk, I have to haul to get it. Here, I can dash right down to get milk, or pick up some fruits and vegetables to make a salad." Mike DeGennaro said a smaller food market didn't bother him. "I eat a lot of fresh fruits and vegetables, and having a healthy option would be a lot better than having to get in the car and drive to Wegmans," DeGennaro said. "I can get other things at places like Rite Aid. I don't mind mixing and matching." Mehaffy said "a good number of grocery stores" were approached about being part of the project. 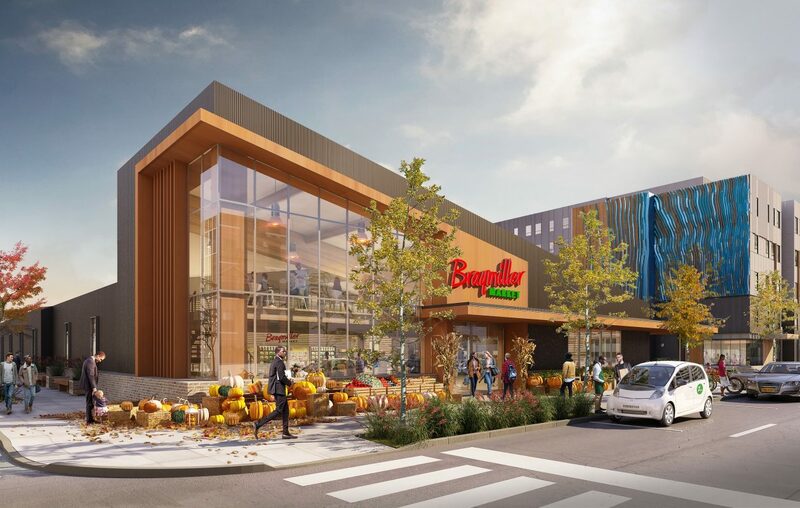 "We had this huge demand from downtown residents saying they want produce and prepared foods, but a lot of traditional grocers were saying from a head count that you're not really there yet, and it's a tremendous risk for us," Mehaffy said. Braymiller, with a wholesale operation that is expected to bring in 80 percent of the revenue, offers a sustainable model, Mehaffy said. The market's two-story steel building has drawn sharp criticism from critics who call its height and materials an example of poor urban planning. Termini calls the standalone building "a tin can." "It's a prefab metal building with metal siding attached to the shell," Termini said. Green said the building works as a separate entity to support his wholesale operation. The 14,000 square feet in the back is basically a warehouse refrigerator for the produce, Green said. The use of steel rather than masonry allows for free-standing insulated panels that he said helps the operation. A long wall planned to run down Clinton Street from Ellicott to Oak streets to shield the food distribution warehouse may be adorned with murals, Green said. The wall would just make an already unwelcoming area worse, said Tim Tielman, executive director of the Campaign for Greater Buffalo. "It is an absolute impenetrable dead zone for two blocks, from Lafayette Square clear to Oak Street," Tielman said, citing the Central Library's footprint. "The solution with the Clinton Street facade shouldn't be another blank wall that turns it into an even deadlier space," he said. Mehaffy said he doesn't think the building's design is foremost on people's minds. "I'm not sure how many people would care about it being in a two-story building," Mehaffy said. "They want fresh produce to be conveniently accessed." Ciminelli's Davison said the expected revival of the nearby One Seneca Tower is part of the reason the developer switched to affordable units, but not the main one. He said a study showed demand for affordable housing downtown. One- and two-bedroom apartments of about 600 and 890 square feet would start at $660 and $790, respectively. Mehaffy said the difficulty in financing new construction projects and the expected financial return were also weighed. The Brown administration has wanted to see more affordable housing downtown. "We believe at the end of the day, for a whole host of reasons, that the city will be a better place if we are more diverse from a socio-economic and racial perspective," Mehaffy said.